Story of the Birth of Durvasa Maharishi - Why is Rishi Durvasa Always Angry? Durvasa Maharishi is Brahma Gyani and a Sage mentioned in Puranas and Epics. He is notorious for his terrible anger and curses and also for instant boons. The popular belief is that Durvasa is an incarnation of Shiva. 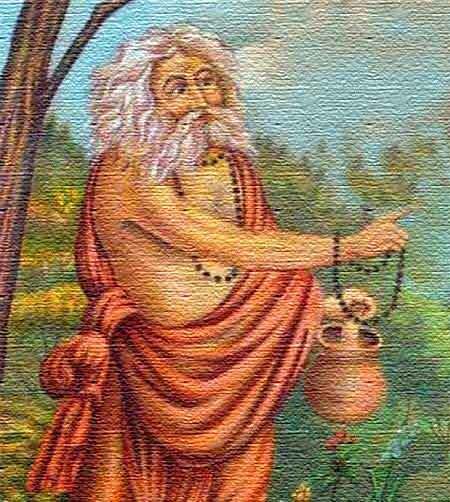 Durvasa was born to Atri Maharishi and Anasuya. Legend has it that once Shiva and Brahma had a verbal duel. The debate soon turned ugly and turned into a full-fledged fist fight between the two. The fight then became a horrific war. Devas that witnessed the fierce angry form of Shiva fled the scene. Goddess Parvati could no longer tolerate the ugly incident and went up Shiva and told him that she is finding it impossible to live with him. Soon anger of Shiva subsided. The anger was then diverted into the womb of Anasuya. She then gave birth to Durvasa. This is the reason why Durvasa is always angry. The anger of Durvasa was responsible for the death of Sri Rama and Lakshman, Devas losing eternal youthfulness, cursing Shakuntala and the fight with Ambarisha. As Durvasa can be pleased easily, he also gives boons instantly. Thus Kunti in the Mahabharata got the boons to beget children from Devas.